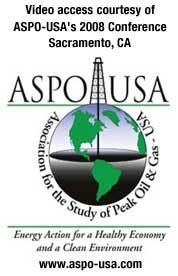 From the ASPO-USA 2008 conference: two long-standing peak oil awakeners: author James Howard Kunstler (The Long Emergency) and Post Carbon Institute Founder and President, Julian Darley. Darley, founder of Post Carbon Institute, is big on sharing: Sharing ideas to quickly inform a public largely unaware of peak oil. Sharing cars as a quick way individuals can get fuel usage down. He notes the “Re” in Relocalization means positive actions we can revive from the past to enable the powerdown transition. “…Chu has been a vocal advocate for more research into alternative energy and nuclear power, arguing that a shift away from fossil fuels is essential to combat global warming. Let’s hope he can make a difference. I’m also disappointed to see that Obama is planning to appoint and surround himself with the same people who created and got us into this mess. It looks like we’ll have more of the same — print and throw more money at it. Make more bubbles to burst. Pretend that the US isn’t bankrupt. Reward the greed, the fraud, the corporations like GM that not only refused to look ahead and design what’s needed, but actively destroyed their viable electric vehicles (Watch the documentary “Who Killed the Electric Car?”). Everything to encourage us to keep on the same path instead of becoming a conserver nation once again. From what I’m reading, people in the First Depression of the 1930s had savings, so they could weather it. Americans are in debt like crazy. But many of them are being smart enough now to work on paying off their debt. The Federal government needs to learn from the people! I spent the holidays working with my family on just these issues — living within their means. Belt tightening. Debt reduction. As we told them, you don’t WANT your credit score to be high! You want to save up and pay for a car, not go into debt. It’s slavery — debt slavery. But you’re onto this — you’ve followed the practices in Your Money or Your Life! Sorry I missed you while I was in California, I am back in Japan again. I’m also sorry I missed your above commentary of Dec. 22. In answer to your question about how to transcend Peak Ego, I think we are in the middle of missing a golden opportunity at this unique point in American history (okay, there have been some similar ones) when our egos have been considerably deflated! A 40% drop in the stock market, the collapse of major investment banks and auto companies, the fizzling of real estate values, all have contributed to Americans questioning their most firmly held consumerist beliefs. Complete disregard for climate change, wasteful consumption of everything, just living for today and forgetting about tomorrow have been replaced by fear about tomorrow. Americans are saving again, “retrenching” and have (finally) elected someone who cares about what the world thinks about us. The era of “Dumb as we wanna be” will be over on January 20th. But are things really going to change this time? While I was in California, I was dismayed by how cheap gasoline had gotten again and how the Californians were racing around like there was no tomorrow. Will they never learn??? I suppose all the research into electric cars and energy efficiency will be shelved again until OPEC and Big Oil decide it’s safe to put the squeeze on us again. While in California I read Thomas L. Friedman’s book “Hot, Flat, and Crowded”. Although it was pretty boring, he had some good ideas for forcing America into a transition to a green economy. One of them was to create a “floor price” for gasoline at $4 a gallon so that all of the research into greener propulsion systems wouldn’t get axed when the gasoline price came down. The differential between $4 and the actual price could go a long way to reducing the budget deficit or funding research into alternative energies. But nahhhhhhh… even Obama is now flogging a $775 billion consumer bailout to jumpstart the old wasteful American lifestyle again. Hi thanks for the wisdom. I also have been thinking and writing about Peak Ego and would love to make contact with Susan. I just became a member of an intentional community about 7 months ago (after having been in 2 communities lasting about 7 years). Also have posted your Peak TV video to the Transtion CA site: http://transitioncalifornia.ning.com/video/two-views-of-a-postoil-future. Going back to Charles’ posting, Jim Kunstler’s new novel “World Made by Hand” describes life in a rural town that has had to re-create community of necessity (so much has fallen apart in a post-petroleum world). There are three or four primary sub-cultures, sub-groups in this town: the struggling ordinary folks; the religious sect that moves into town; the tough guys in the trailer park; the wealthy landowner with essentially a serfs working for him. We only touched on it in this conversation, but I think you’ll see some of his reflections on community. Richard Heinberg talks a bit about forming community in Powerdown and other books (the notion of Lifeboats). Right now I think he’s emphasizing governmental activities because of the larger-scale effects as the complexly interdependent systems begin to break down. (He himself lived in intentional community for awhile). Stuart’s point about so many “failed” communities is pretty sobering. We taped and haven’t yet produced a conversation with Diana Leafe Christian on her book about finding intentional communities, and she talks about what the 10% of successful communities do to enhance their success. I lived in a small household-sized community for about eight years, and we were in pretty strong alignment. But I think learning how to transcend the individual, how to look for the larger good, how to disagree yet keep moving, how to not have one or two individuals block everything (as in full consensus) — all challenges ahead of us. One thing I learned in community was that one can’t make it happen. It has to start from the relationships first and grow into a communal physical form. Having the outer trappings of living in proximity, etc., won’t do it alone. Now I can see that clear agreements and a shared vision (and the other elements Diana Leafe Christian talks about) are also important. As Susan reminds us, we’re at Peak Ego. How do we transcend that? You said many interesting things. I wouldn’t blame Corpernicus for causing modern day individulaism, though. He simply discovered a fact and reported. Maybe your point was that when the Church controlled everyone’s lives (in collusion with the nobility), people had a sense of being a small part of something very big. Maybe after Copernicus (and certainly during the Reformation) people began to question the Church’s doctrine and authority and decided there were many ways to heaven, not just one. There is a long tradition of religious splinter groups forming isolated communities where they sought to create the “true” Christian community. At any rate the monolithic Catholic community prior to the Reformation was too far in the direction of a collective where the vast majority, the “serfs,” had virtually no individual rights and lived at the convenience of the nobility and the Church. That is also an extreme we don’t want to emulate. But your point is right that we Americans have gone too far in the direction of individualism and relearning community interdependence will be difficult. I know it is difficult for me. My dream is to someday join an intentional community, I am definitely a follower and not a leader. I am just very aware of how difficult it is for people to cooperate on a longterm basis. Susan, keep the interesting comments coming. I think we are also at Peak-Ego. Our culture is at the end of the movement to liberate the individual that started with Copernicus’s discovery that, contrary to Church doctrine, the earth revolved around the sun. That was the beginning, philisophically, of empowering the individual and of course, his ego. So now we’re too far over in that direction, and have a very hard time getting along with each other. Our lifestyles insulate us from each other and from any immediate sort of community life, in which we share things necessary to our common survival. We have very little language, even, to share emotional realities. Intentional communities are doing pioneer work in trying to develop new cultural norms that equip us deal gracefully with interpersonal relations. It’s a difficult row to hoe; but we may be in for a crash course on that. Just wanted to let you know I am passing the Lemonade Award on to your site. Please click here for more info. Keep up the good work! I have long been interested in so-called intentional communities and am a frequent visitor to the Intentional Community homepage. I often use their “find a community” feature to see what kind of intentional communities can be found in certain American states or even foreign countries. I must say I am almost always disappointed by the number of communities that seem to be forever “forming.” The many cohousing communities seem to be very expensive. The only serious efforts at creating intentional communities almost always have strong religious elements. One of the few exceptions I found was the Dancing Rabbit community in Missouri. My point is that many a community is founded with a great deal of enthusiasm and idealism, only to go belly-up when egos flair or people lose interest. Maybe you were alluding to that in your comment about people being burned in the 1960’s. An even older and sadder case was the New Harmony village that was built way back in the 1800’s. In your last question “…why do we not talk about the small-scale socieities that (still) constitute the majority of the places people live?” are you talking about neighborhoods? I think anyone serious about creating a strong community should start in their neighborhood. If we wait for the government to pass some laws mandating it, then we are admitting we are too lazy to do it on our own. The many commentaries here at Peakmoment have a wealth of resources and examples for us to use. I am very intrigued by the idea of turning parkland into small vegetable gardens. But another problem we will soon be facing is the aging of our communities. I think senior citizens are both future liabilities and assets that will be very important in our communities. In my neighborhood it is only the retirees who show any interest in building community, by doing trash pickups, beautifying the streets by planting flowers, and organizing neighborhood get-togethers. The young are still too wrapped up in their cell phones and cars to participate. I actually think building a strong community has become somewhat of a mantra here at Peakmoment, and yet it seems an unattainable dream. Social critics, like Kunslter and Heinberg, do get the story right, but miss something essential in current responses. They miss, or fail to emphasize, the importance of re-creating community as a front-line defense against the perils of peak oil and financial collapse. Perhaps, being of a certain generation, they got their fingers burned back ine 1960’s — the hay-day of communitarian experimenalism. I find it hard, otherwise, to understand why neither ever refers to the 140 cohousing communities now in existence in the United States; the evovillages, like Ithaca, that combine community and agriculture; the transition towns, like Tottenham in England; or the various quirky religious societies, like the Hutterites, that clearly have someting to teach us. If, indeed, complexity and nation state are artifacts of cheap energy, then why do we not talk about the small-scale socieities that (still) constitute the majority of the places people live?